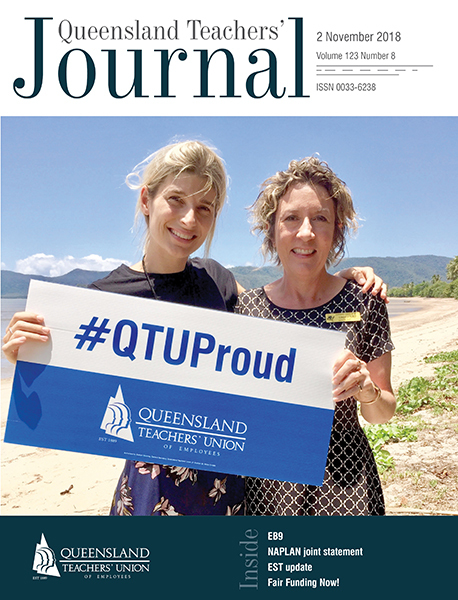 QTU Biennial Conference 2019: see you there! Every two years, delegates from across Queensland come together to set the agenda for the Union. Next year, the Union’s 130th anniversary year, the Biennial Conference will be held from 1 to 3 July (the first Monday, Tuesday and Wednesday of the winter holidays). Essentially, it is a time for us to reconcile, remember, celebrate, set the agenda for the next two years and put in place strategies that empower members to make it happen. Conference showcases all that we do and provides an opportunity for members to hear from some great speakers about our profession, our Union and our campaigns. If you’ve been wanting to get more involved and have been seeking the opportunity to take part in the Union’s decision-making processes (beyond workplace and branch level) now is the chance. Nominations for a State Conference Delegate from each branch, Area Council and TAFE are in this Journal. There are also two conference delegate positions for members who identify as Aboriginal and/or Torres Strait Islanders.